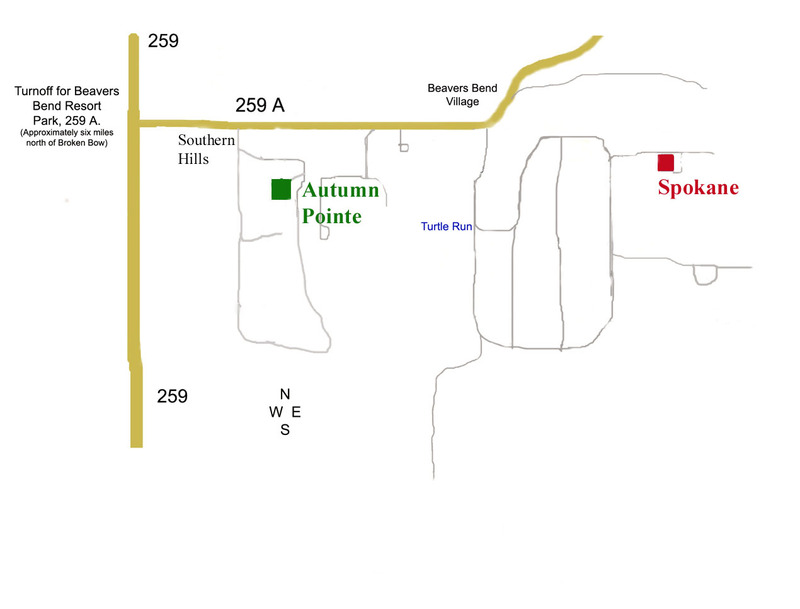 Please view maps for the location of "Spokane"
From the intersection of hwy 259 and hwy 70 in Broken Bow, drive north on hwy 259 about 6.3 miles. On your right, you will see a large green sign that reads Beavers Bend State Park / Beavers Bend Area (directly across from Mountaineer General Store and Hochatown Country Lodge).This is 259A. Turn right on 259A. Continue driving about 1.8 miles until you come to a sharp left bend. To your right you will see a maintained road. You will see a wooden sign that says Beavers Bend Village. This is the entrance to Beavers Bend Village and Wildhorse Plantation. There is a cabin and a house on your left and a rock house on your right after you turn onto the road. Continue to the three way stop sign. Make a left and continue to the end of the road. Here you will make a left and continue driving as the road will bend to your right. Keep driving and continue through another right bend. You will then take your first left. Continue driving up the road. Spokane will be on your right. Copyright ©2012 Broken Bow Cabins. All rights reserved.